Here are few few photographs of a steel stair constructed with PFC (parallel flange channel) stringers and with bolted on HW timber treads. It provides access to a large exterior deck that we built in 2004. The owners have kindly given me permission to go back and take these snaps. Thanks, Pete and Chris. Steel stairs - Bottom of stair concreted in. Note SS wire infills to the handrails one side and fixed FAC panes the other. Any steelwork that goes into the ground, ALWAYS must have concrete around it. Don't let the earth get filled in around steel. It holds the moisture and the steel rusts away quietly without being seen. I put these collars around the top of the foundations, just to bring concrete above the surface, and with a slope away from the steel, even when the the owner says that he will be concreting the full area at a later date. I just tell them it is a simple job to remove the collars later. Protect that interface! 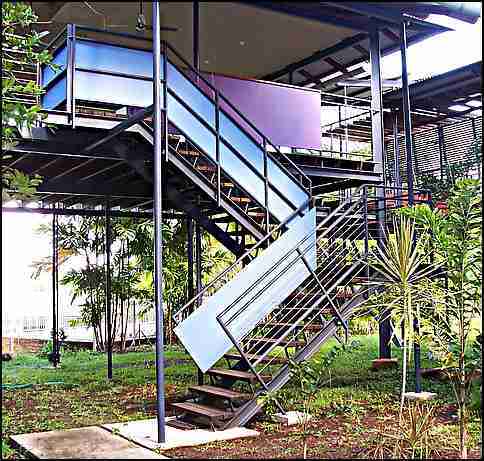 Steel stairs - Transition from string to landing. 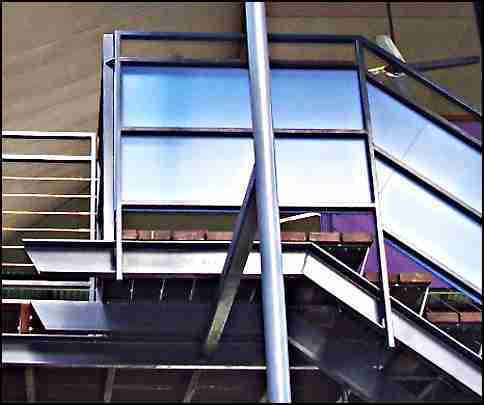 Steel stairs - Top landing channel runs through for architectural effect. As you can see we had to do a few architectural features on this one. For once I think the architect did a good job. I usually go for simplicity and function but the extra bits on this one add to the overall effect. Vertical and square off, hand rail supports. SS Wire and solid sheet panels. Overhanging ends to the stringers, with yet another angle to cut. 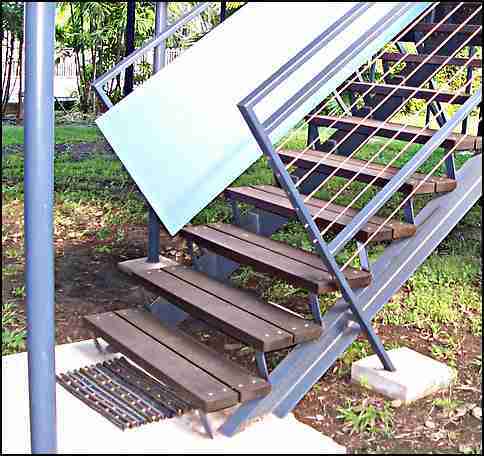 Setting out a steel stair like this is no different than a simple timber one. The same rules apply. The rise is the same all the way from the bottom concrete pad to the top of the deck. What is different is the extra amount of drawing. If you are thinking of trying something like this, pick up a cheap CAD program. It just makes things so much easier. I would still use a sheet of ply and sketch it out by hand if I didn't have the CAD program of course.